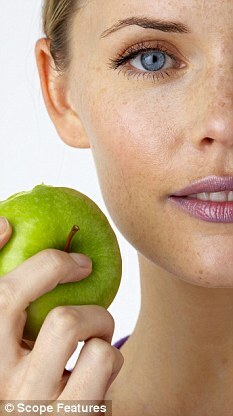 Apples are the next big anti-ageing ingredient. Not just any old apple, mind, but a rare Swiss apple from the Uttwiler Spatlauber. High-end creams that contain it already have an A-list following and eve First Lady, Michelle Obama, is said to use an expensive skin serum with an extract from the stem cells of this apple. Apparently the variety stays fresh for up to four months after being harvested, long after other varieties have shrivelled up. It’s believed stem cells from the fruit can stimulate human skin stem cells, thereby protecting skin cell regeneration and delaying the onset of wrinkles. Sounds amazing, doesn’t it? Apples are also right in antioxidant flavonoids, which can protect against environmental damage to the skin, as well as phenols, which provide UVB protection, making skin more resistant to sun damage. Braeburn, Fuji and Red Delicious are all rich in phenols. However, with Uttwiler Spatlauber apple creams costing around £200 (this discovery is yet to find its way into high street products) for the moment I’d rather eat apples than put them on my face! This entry was posted in Anti-Ageing, Ask the expert, Body Beautiful, celebrity, cheekbones, Harley Street Skin Clinic, Lesley Reynolds and tagged anti ageing, apple cream, apples, first lady, michelle obama, skin care, skin serum, swiss apple, uttwiler spatlauber, wrinkles. Bookmark the permalink.